Torbens 4 feet speakers has the drivers in 3 separate boxes. 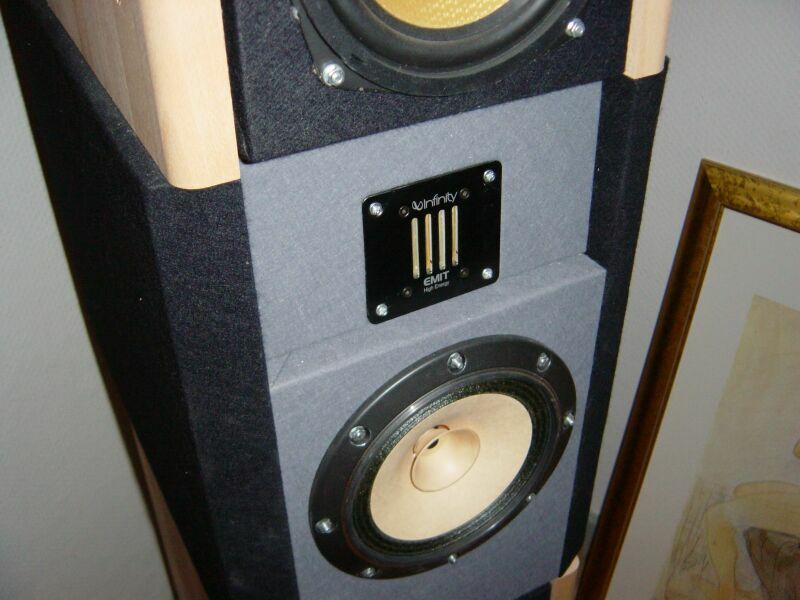 A total of 6 Monacor 6,5" woofers makes a really big Sd and high sensitivity as well. Crossing over at 300 Hz a Fostex fullrange covers the midrange helped by the small Infinity EMIT in the top range. Torbens gear has dedicated place in the cellar of his new house. It is still very new and unfinished with foam matresses on the walls and a very special rough look. A lot of work awaits Torben, before his dedicated listenign room is finished. The CD is a N'Tjoeb. 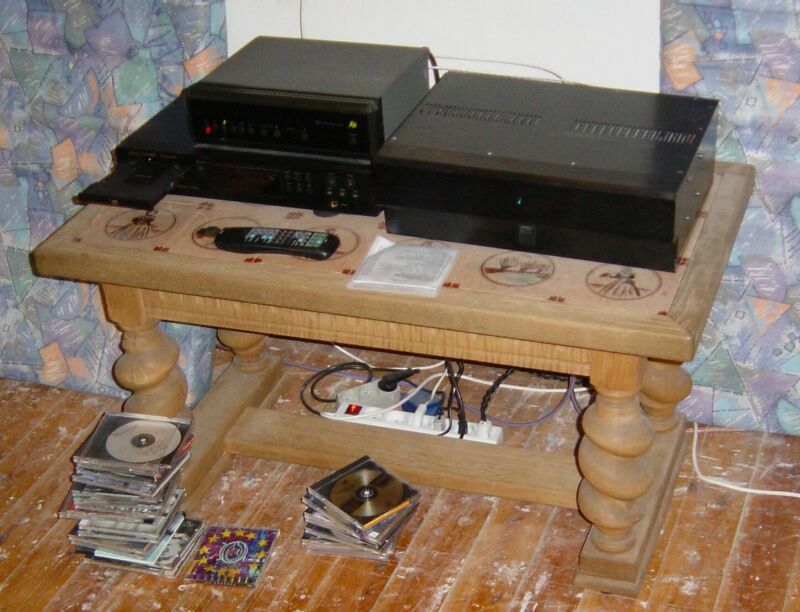 Then there are the AVI preamp and a Sirius (Gamut) poweramplifier. Cables are from Gamut and the Oval 9 speakercable from Analysis Plus (The amps has since my visit been replaced by af Pathos integrated). 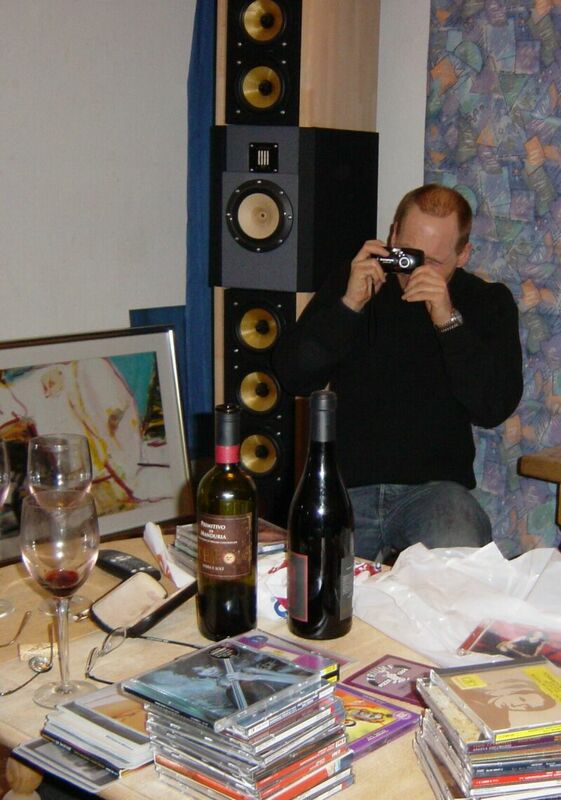 On the left Torben behind the camera, taking a picture of a picture beening taken!! Behind Torben the left speaker and on the table what must be there when they guys are together - nice red wine and a lot of good music. Below a closer look at the mid/treble section. The little Emit will soon be replaced by ESS air motion transformers. The Fostex is resonsible for a very open and transparent dynamic mid, but at the same time has som "hardness" in the upper midrange. which can be a bit annoying playing powerfull vocal material. Now Torben has removed the whizzer-cone and dampened the cone. The listeners are ready. 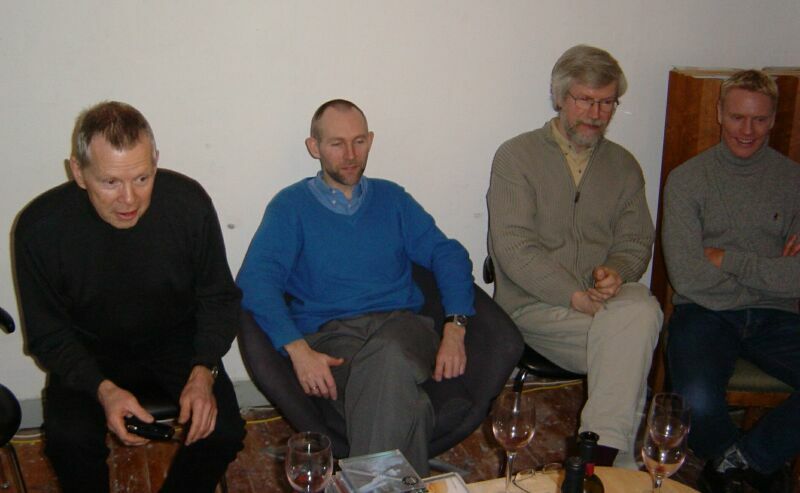 Here from left Peder, Jens, Steen and Thomas.